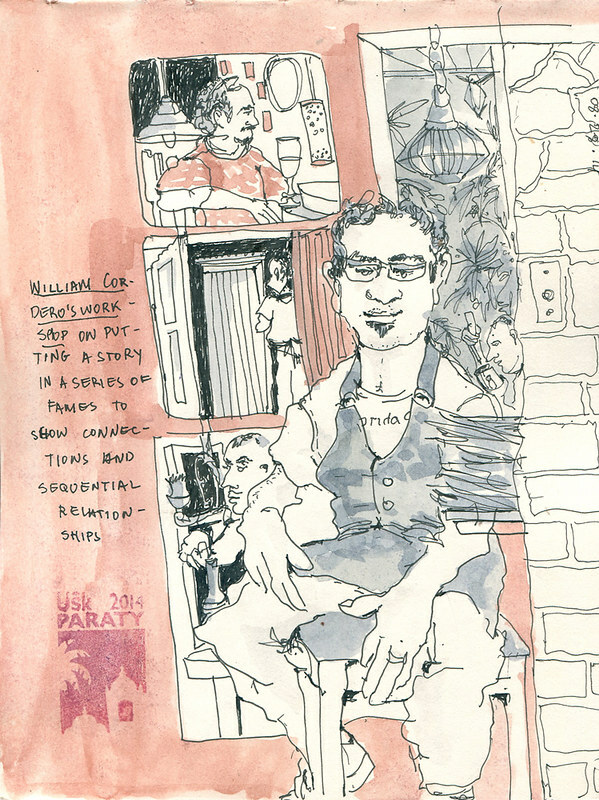 All of the Urban Sketchers Symposiums I have attended so far share certain characteristics in common. 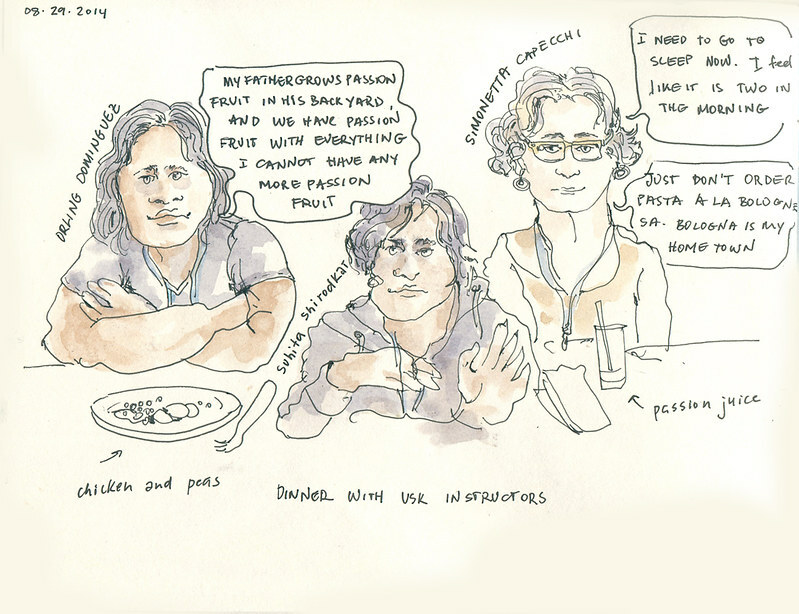 I produce some of my worst drawings during the symposium. The first couple of days seems incredibly long and exhausting. Last night ends up being the culmination of the experience with all of its social, emotional and sleepless attributes. The last day catches me by complete surprise–I realize there are still so many people I haven't talked to, so many sketch books still need to be marveled at. I make the most amazing discoveries in the last minutes of the symposium. All of a sudden it is all over. I feel the mixture of nostalgia, inspiration, exhilaration, and exhaustion. 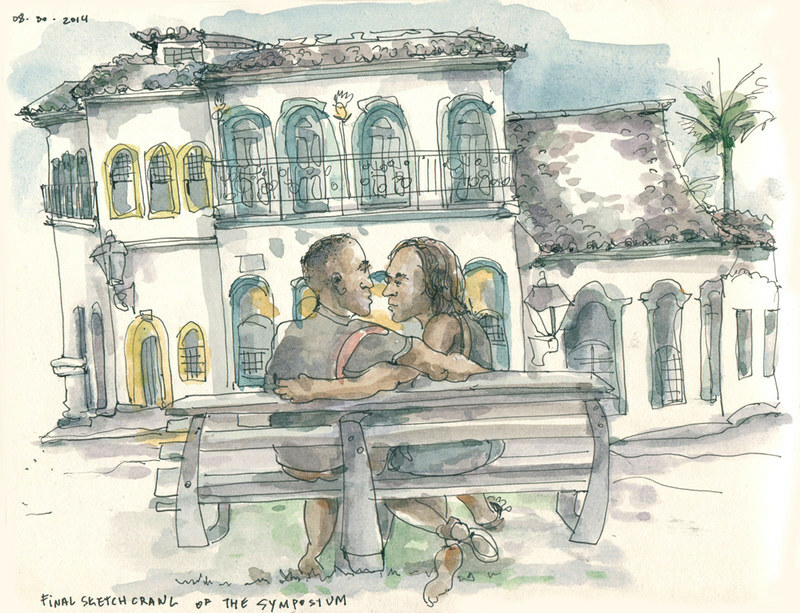 This year the committee chose Paraty, Brazil as the place to hold the annual symposium. 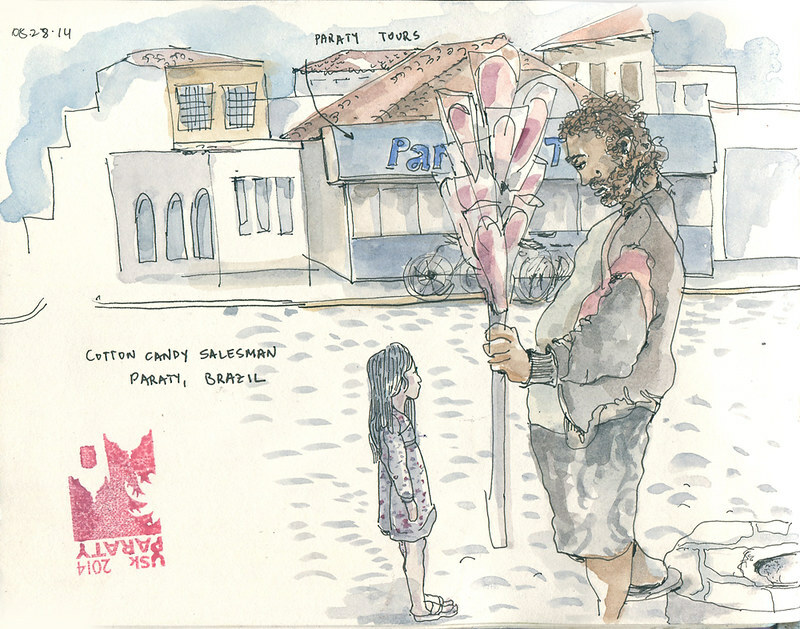 Paraty is a historic little town about 4 hours south of Rio. The only way to get there is by taking an incredibly scenic, windy and bumpy coastal highway from Rio or San Paulo. If you are heading to Paraty and trying to choose between taking a bus or traveling by car or shuttle, pick a bus. Brazilian buses are incredibly fast and comfortable. As far as the colonial town itself it looked a little too well preserved and freshly painted for my taste. I always felt like I was in some sort of Brazilian Disney Land. The roads in the historic center are closed to motor traffic but walking them is pretty close to impossible as they are made up of giant slippery and uneven pavers. To make matters even more curious the city gets flooded every day at tidal times. Supposedly, this was an ancient system of cleaning the streets. Its real effect is that the water in its surrounding beaches is filthy and unsafe for swimming. 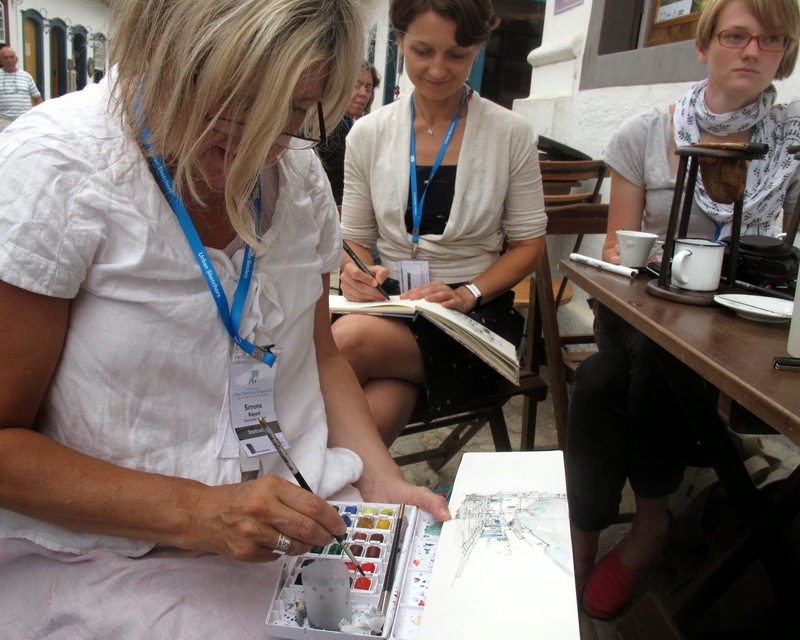 Simonetta Capecchi had the most creative setup for her workshop on Sketching Reportage. We were driven outside of Paraty in a military style tour vehicle. Initially I had no idea what was happening and where we were going. Simonetta kept showing her amazing drawings of illustrating stories right as they are happening, while our own adventure was unfolding at the same time. Finally, we arrived to what turned out to be a cachaça factory called Pedra Branca. 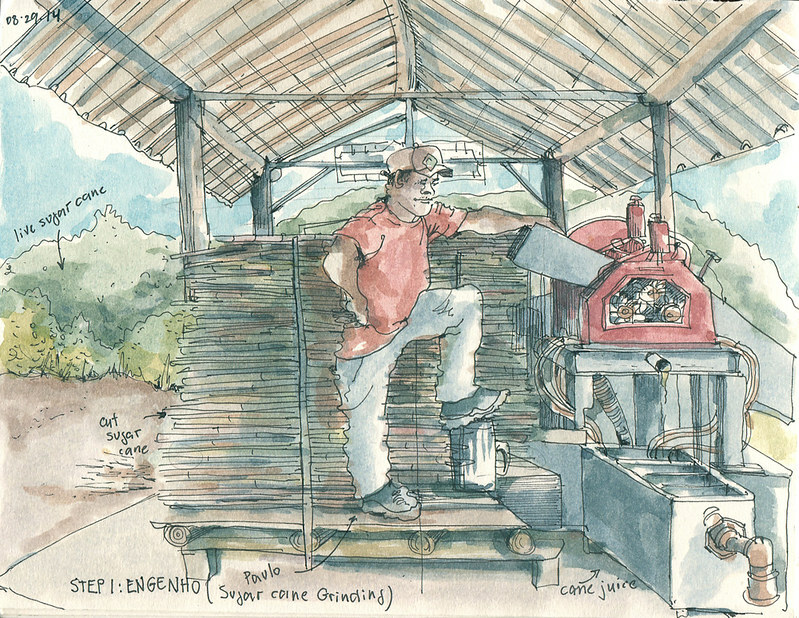 Simonetta instructed us to draw the process of producing cachaça–Brazilian liquor made from sugar cane juice–from the growing of the sugar cane to the final stages of bottling and selling the ready liquor. 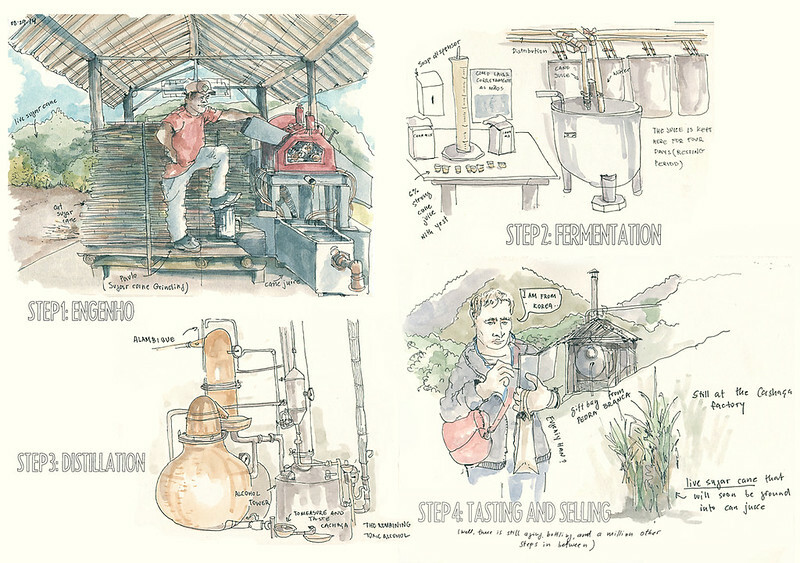 The process of producing cachaça is pretty complicated and involves a series of stages, a combination of mechanical and chemical. We had amazingly patient and hospitable guides who didn't mind repeating the same names for machines and processes in Portuguese–"engenho, "alambique" again and again as we detailed it on paper. 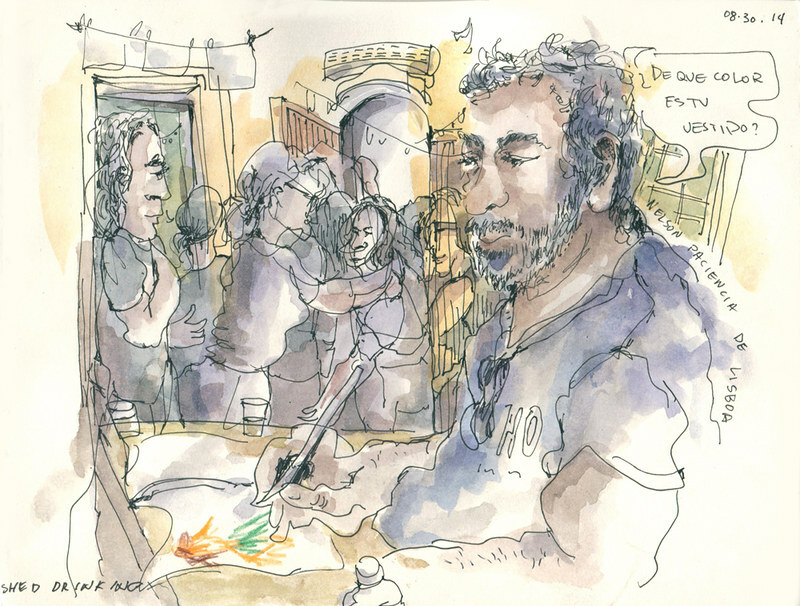 After the final sketch crawl on the main square of Paraty and the infamous group shot of all of the symposium participants a few of us headed to the closest bar for a well deserved pint. A street performer were entertaining tourists with a rather spooky human size singing doll that she was flailing between herself and the audience of quiet diners. I met a very fun German couple that was on their way to celebrate their honey moon on the Brazilian island of Fernando de Noronha next. We were off to the closing party of the symposium next. The animated crowd of sketchers was bidding on the sketches made by some of the participants to benefit the organization, drinking beer, and snacking on hor d'oeuvres. I was more than impressed by the skills of the DJ who was hired for the evening. Not only was he masterfully spinning the tunes, he would also play along the recorded music either on a flute or on a set of cachaça bottles that he had previously emptied. By the end of the party most everyone was out dancing. After the closing party was over a group of us headed in search of more opportunities to celebrate and socialize. 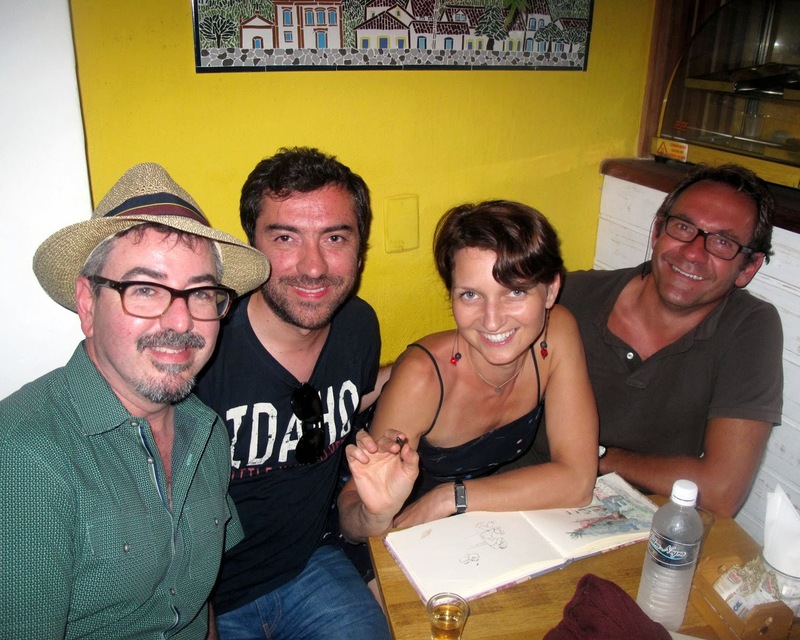 We came across a cozy bar with live Forró music and dancing called Gamboa. 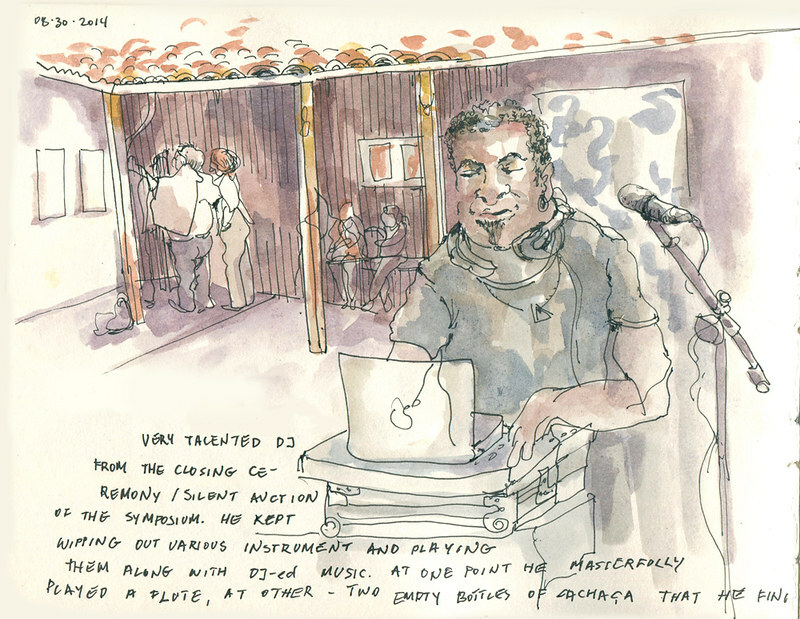 A few very happy hours were spent here dancing forró, sketching, and getting to know even more amazing sketchers from all over the world. 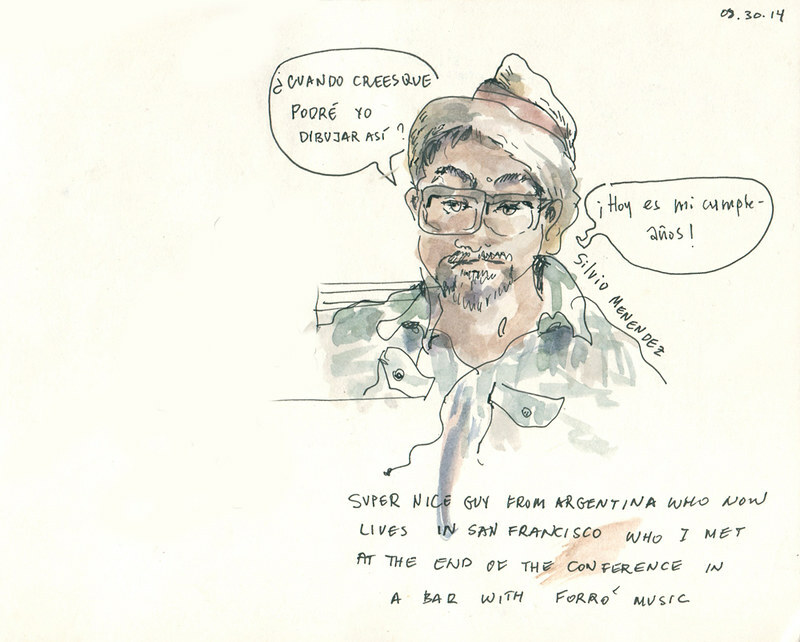 Below are the sketches of Silvio Menendez from Argentina/San Francisco and Nelson Paciencia from Portugal who were with us at Gamboa. As it always happens at the end of an amazing evening I did not want it to end despite knowing that the following day was going to be brutal. 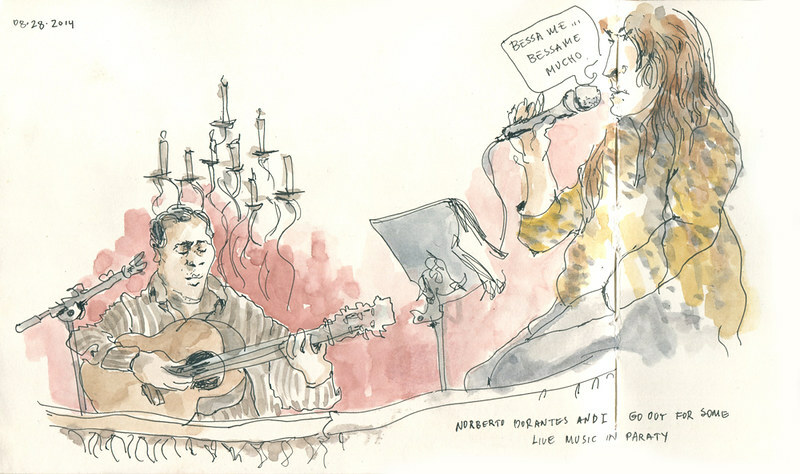 The sketch captures the final moments of the night at Gamboa with friends that gradually turned into the next morning. I had a few minutes to capture the sunrise over the little town of Paraty from the terrace of my pousada while waiting for a ride to the bus station. 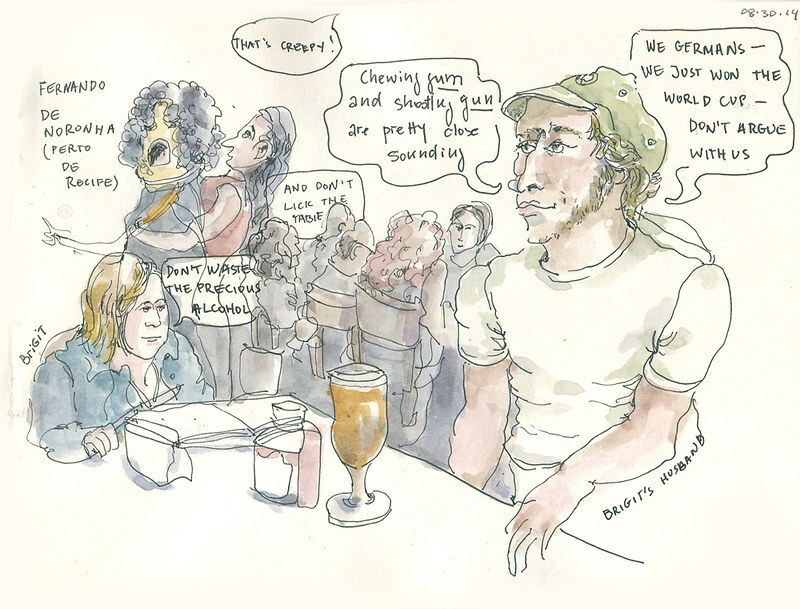 Another Urban Sketchers symposium was over. This grand adventure was coming to its close. The amazing summer of 2014 was also its final gentle breezes. Extraordinary post Rita. The power of your drawings and your entusiastic description worked for me as a time machine. Obrigado.